Besides being colorfully imaginative, the concept image on the left displays the essence of a well-known, easy-to-grasp, yet insightful psychoanalytic “motion” model of psychological relationships and interactions that has useful applications in both personal and personnel assessment. One figure is moving away from the other two, which, on one interpretation, are themselves moving toward or moving against each other (depending on whether like or unlike magnetic poles are matched up). According to this motion model, a key dimension of relationships and interactions is how an individual “moves” relative to other individuals—either on a case-by-case “state” basis or in general, as a “trait”, i.e., in ways specific to single relationships and interactions or the same way toward virtually everyone and most interactions. 1. “MOVING TOWARDS” designates positive psychological approach, e.g., as a manifestation of the “Big-5″ personality trait of “agreeableness”, of helpfulness or attraction. In Horney’s typology this correlates with “compliance” (which she uses in a much broader sense than most of us and specifically I do, below) and seeking “appjroval”, “affection” and a “partner”. 2. “MOVING AGAINST” encapsulates the negative dynamics of psychological, (including emotional) resistance, antagonism, anger, imposed control of others, hostility or attack. Horney interprets this as “aggression”, manifested, for example, in the need for power and in exploitation of others. 3.“MOVING AWAY FROM” designates psychological avoidance, such as from distrust, fear or distaste (which, in some circumstances, can resemble moving-against as resistance, e.g., in instances of passive aggressive sabotage through evasion of responsibility, and therefore require acute discrimination to identify it). Horney associates this with “detachment” and “autonomy”. A clear and comprehensive overview of Horney’s typology—which serves as the core paradigm for an “Enneagram” personal-growth program, can be found here. Of special interest are the application of and manifestations of these three types in neurotic behavior, e.g.,in a neurotic need for approval or in neurotic exploitation of others. When the “motion” is a manifestation of a permanent disposition or personality trait rather than of a fleeting state, knowing which of the three it is enables insightful differentiation, explanation and prediction of habitual behavior, e.g., when an employee mysteriously not only seems generally disinclined to cooperate with and contribute to a team, but also to avoid competition with its members, determining whether the employee trait is “moving away from” (avoidance), or instead “moving against” (passive-aggressive resistance) can facilitate addressing the problem. Among other considerations that makes this a useful and intuitively appealing model is that it reduces the seeming complexity of human relationships to a “kinesthetic” transparent classification based on muscular sensations: Because everyone knows what moving towards, against and away from feel like physically (in terms of muscular exertion in a given direction or with a given force, with or without resistance), the labels allow us to instantly and intuitively grasp some of the key underlying psychodynamics of relationships and interactions. Psychologically, such kinesthetic modeling and translation of personality can be of great heuristic (teaching), guidance and tactical value, much as politically cliched kinesthetic slogans like “moving forward together!” are, despite their otherwise being utterly empty slogans. The model also makes it easier to distinguish cooperation from compliance, in psychodynamical and personal terms. Kinesthetically, proactive cooperation “feels” like moving towards, whereas mere compliance, which can mask a desire to “move against” or “move away from” does not. In employee management contexts distinguishing a cooperative worker from a compliant one can be crucial to wise decision making about how much of a leadership role to assign. To the extent that this 3-factor motion model is so viscerally and kinesthetically intuitive makes assessment of whether, to what degree and in what proportions a job candidate or employee is or needs to be cooperative, competitive, compliant or contrarian easier and more transparent. For example, a stock broker who seems to have no appetite for either competition or cooperation with other brokers, may, on the surface, seem to be a poor organizational fit, since the common presumption is that an effective broker (or, indeed, any employee) has to thrive on and be effective with one or the other, or at least a mix of the two. 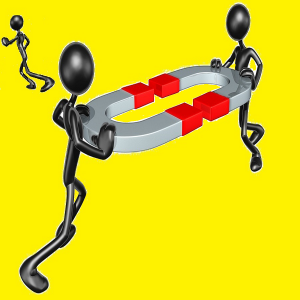 But, theoretically—in terms of this motion model, that competition-cooperation averse broker may perform very successfully as a “moving away” loner, e.g., in virtue of being motivated by something other than competitiveness or cooperativeness—such as the challenges and rewards of closing a deal. This suggests that instead of insisting that a job candidate be an aggressive “go-getter” competitive (“moving against”) type or a rah-rah “team player” (“moving towards”) type, in any concrete screening, the recruiter should give appropriate weight to the possible benefits of hiring a “moving away” type, or at least to allowing that, as a trait, the propensity to “move away” can be a valuable candidate asset. Careers congenial to and suitable for the “moving away” type include various jobs as analysts, theoreticians, painters, night watchmen, musical soloists, writers, designers, inventors and telecommuting workers. An even simpler interpretation of the three modes of motion is provided by basic particle physics and dynamics: Two marbles or other objects and particles can either move toward each other, away from each other or against each other—through collision, abutment or friction. As for orbiting each other, what the psychological counterpart will be is interesting to contemplate, but, given the physics of angular motion, my guess is that it is a balanced form of moving toward and away from, i.e., “ambivalence”–conflicted feelings, regarded by some as one of the most important concepts in all of psychoanalysis, yet strangely not incorporated into the Horney motion model. From a slightly different perspective, the 3-fold classification of psychological and physical motions can be recast as “attraction”, “repulsion” and “stasis” (a static condition), including ambivalence or “resistance” (e.g., in a moment of collision or friction), with resistance perhaps being further analyzable in some instances as a combination of attraction and repulsion manifested as “stasis”, e.g., psychological paralysis. Such stasis, inertia and ambivalence do not seem to factor into Horney’s original typology, despite their commonplace occurrence in daily life and analogues in physics, e.g., perfectly balanced and opposing forces in an arch or in orbiting, which, in virtue of its being relative motion with no change in distance is a form of stasis (at least with respect to representing no change in degree of separation). …despite any initial resistance you may put up to the idea.